"Let me entertain you", they exclaim! Our April 2016 production of Gypsy features two alternating casts of "Baby's", both with tremendous talent and sparkle! Today we are thrilled to give you a sneak peek behind-the-scenes and an opportunity to get to know the four young ladies who will take on these iconic roles later this month. Berkley Silverman appears as Baby June in her Wavestage debut. Berkley is truly a triple-threat performer, with extensive experience in tap, jazz, acro, and lyrical in addition to multiple acting and singing credits. On her excitement for playing this role, she explains, "my favourite part about playing Baby June is that she is fun and energetic. And I get to tap dance!" Berkley's favourite number in this production is her featured performance in Let Me Entertain You, "because I love doing the dance and practicing with [my double,] Rachel." She continues, "I am most excited for my costume and seeing the show in it’s final stages. " Her previous credits include: Once on This Island (Little TiMoune - CYP), Mary Poppins (Michael - UTC), Annie Warbucks (Annie - Characters Theatre Troupe); TV: Game on! (Cindy - YTV), Paw Patrol (Everest - Nickelodeon). She is currently a student at Baythorn in their Arts Program. Rachel Marshall will also be making her Wavestage debut as Baby June in Gypsy. Rachel is a passionate, energetic performer through and through. When asked how she brings this energy into her performance, Rachel explains, "[Baby June] has extreme confidence and sass that really shows when she dances and it is fun to act." She sees a few similarities between herself and her character. Mainly, "I also love to perform and be on stage!" It is an undeniable challenge for any young performer to step up to the plate in an adult production. On approaching this challenge, Rachel says "It can be intimidating at times because you want to fill the expectations of someone more experienced than you, but it is also satisfying to learn so much more in a production with experienced people." Rachel simply can't wait for audiences to experience this show. "We have so many talented and committed cast members that make the dance numbers extremely well done and in sync." One of our talented Baby Louise's is Hannah Billo. Hannah was last seen on stage in The Wizard of Oz this January. She has also recently be seen as Tootles in Peter Pan. The role of Baby Louise is a sharp contrast to Hannah's vibrant persona. "I am usually a bright-eyed, crazy, energetic person on stage, but Louise is very shy, so it is fun to play around with", she explains. "I have learned so much, to the point that it is crazy!! I come home talking about all the things I've learned that session. My favourite subjects that we've covered are: tap dancing, improv and how to nail an audition. But that is just Monday nights. While rehearsing for musical productions you will get to learn new songs, new choreo, and different acting roles. You will also get to work with new people and get a ton of experience! But most importantly we have so much fun!" Heather Smith, in her third season with Wavestage, will also be seen as Baby Louise. Her favourite parts about playing Baby Louise are "having different emotions than most of the other characters I have played, like shy, nervous and timid. I also love that I get to hold and work with a cute little dog." In addition to her many appearances in Wavestage youth productions, this is not Heather's first time performing in our MainStage adult productions. She was last featured on stage as Jane/Tootles in our Spring 2015 production of Peter Pan. "I enjoy being with adults because I can learn so much from them and they are always so nice to me", she explains. When Heather is not performing on stage she can be seen playing soccer as a keeper on the Newmarket United U12 team. 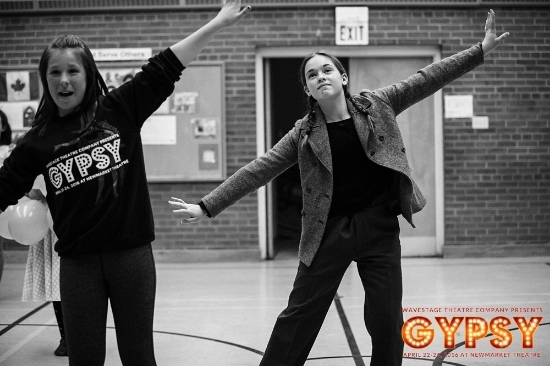 Gypsy will run at Newmarket Theatre from April 22-24, 2016. Don't miss this thrilling musical production!